Coffee, Cookies and Internet in White Sand Ko Chang. The Cafe de Koh Chang is in the center of White Sand Beach. There you can relax by a cup of Doi Chaang coffee and delicious cookies. Cafe Koh Chang has as well ice coffee, cappuccino, espresso and other coffee specialties for good prices. From the terrace of this Cafe in Ko Chang you can watch the busy main road while you enjoy a delicious hot cup. 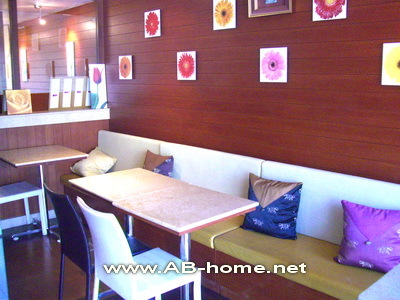 The section inside is air conditioned and offers internet access and a good location to enjoy your holidays in Thailand. Café de Koh Chang is rightly a leading coffee house in White Sands. The reasonable prices and the friendly service attract many tourists and traveler who don’t want to miss coffee specialties, smoothies and fruit shakes on the elephant island in Thailand.